Home » Chennai » Travel Theme Tradition – Kili Jodishyam! Travel Theme Tradition – Kili Jodishyam! But have you ever had your future told by………a bird?? 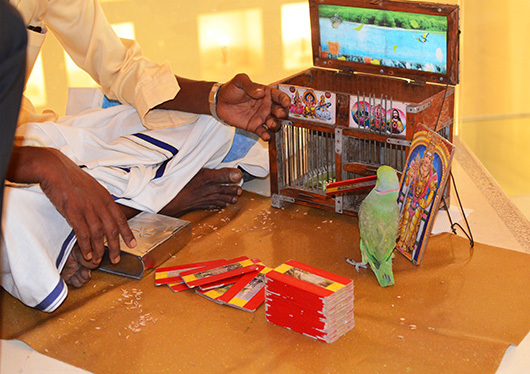 Meet the parrot astrologers of Tamilnadu! 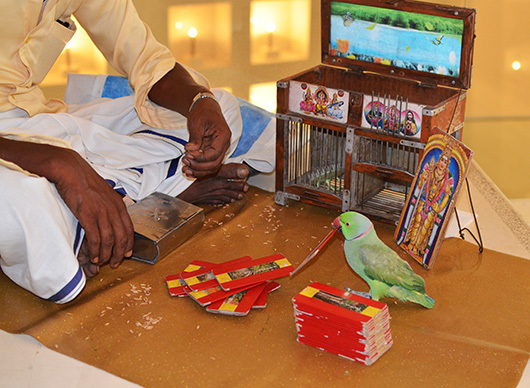 Parrot Astrologers foretell your future with the help of green parakeets (the rose ringed in this instance), called Kili in Tamil, hence the name Kili Jodishyam. 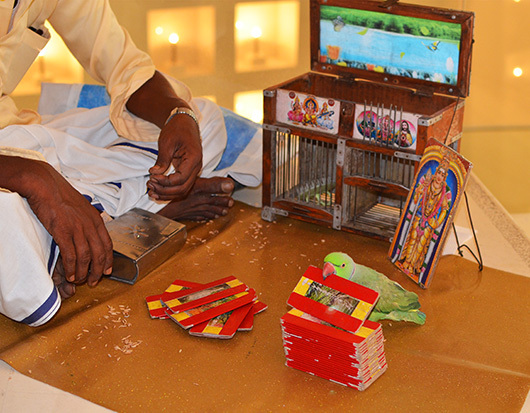 The parrot is trained to pick up cards from a deck on cue, and choose that one perfect match, from which the astrologer interprets the clients future and answers specific questions! One astrologer said in an interview “It is a science. Out of my 10 predictions, at least one will come true in life.” Really? 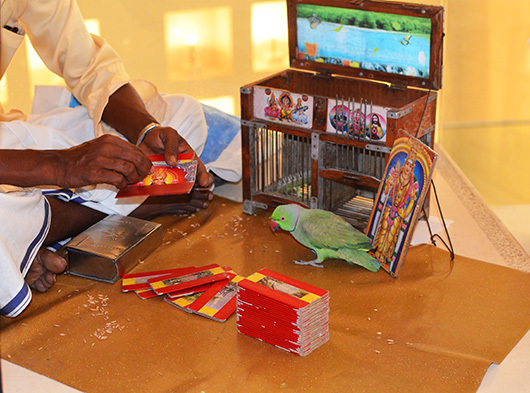 He added “But people are losing faith in parrot astrology these days” I wonder why! Do check out her post on the Latin American tradition of Quinceañera and other intriguing traditions here. Oh Madhu, this is priceless. I will not rest until a parrot has predicted my future! I was clueless what I was going to post for your challenge Ailsa, until I chanced upon this guy and his bird outside the restaurant we went to for lunch yesterday! 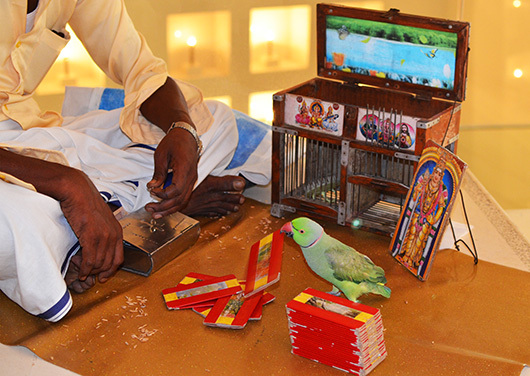 “A little bird told me…” Lovely post, Madhu! Quite funny the cards have the Spanish colors flag (red-yellow-red). Is this parrot trying to tell me something haha? That little parrot is about as reliable as the weatherman! Cute though. A wonderful post for the theme. So the saying “a little bird told me” is true? Pictures worth a thousand words. Neither do I, but all of us have our horoscopes made at birth. I have a little booklet with my entire life spelt out in 20 year periods!! Quite accurate depending on how it is read 🙂 I refused horoscopes for my daughter and grandchildren though. Didn’t want their decisions influenced by ‘destiny’!! Yeah, calling that a science was a stretch by any standards 🙂 Thanks for the comment Sally. Exactly! I was thinking I could do it in five 😀 Thanks Robin. Gosh, I didn’t know you were so predictable, Madhu! I’m a total sucker for this kind of thing….but it would make me really nervous having a bird forecast my furture….to believe or not to believe. Fun post Madhu. I am learning so much from you! Your future predicted by birds, hmmmm! Learning so many fascinating things through this week’s travel theme! Thank you Naomi! i remember Paul the Octopus picking the world cup soccer team of the day! I read the book, A Fortune Teller Told Me, but parrot astrologers weren’t mentioned. I wonder what will take its place if indeed parrot astrology is on the way out. Something will. 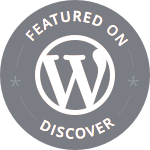 Interesting blog. Never heard of this, but I would give it a go. 1/10 though, I think I could manage that on my own, but the little guy is cute. I’m very impressed by this clever bird! 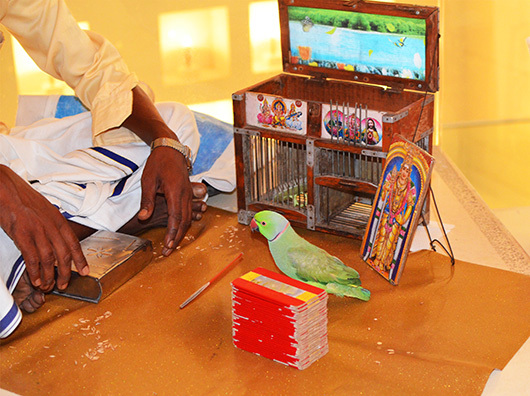 Madhu, these parrots are classic. And so talented! Thank you for bringing them across the world to me. Very interesting – talented bird!! 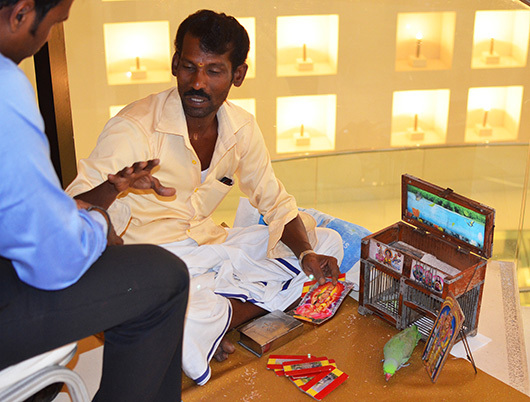 I’ve had two psychics – not birds – give me a reading. That’s as close as I want to come to knowing my future. They were on target. Really shook me. I suspect most predictions are worded to sound accurate Judy! I was stunned by how accurate the coffee reader in Istanbul sounded! And my horoscope predicts, almost to the month, the date of my marriage and through mine, my daughters too! Uncanny even for a cynic like me 🙂 Scared me off making horoscopes for any of the kids! Madhu, you transported me right back to my Bangalore neighborhood where I grew up – the area was dominated by Tamilians and the Kili Jodhishyam was famous there. Thanks for bringing back old memories. You are welcome Shaantz. Did you live in Malleswaram? Time seems to have stood still in that part of Bangalore! But the humongous Mantri Mall is a rude invasion. We lived in Bangalore Cantonment area – heard of the Ulsoor Lake? We lived in that area for some years during my school/college days and I’ve seen many a kili busy at work! Yes it does Kavi 🙂 I have been meaning to visit one of the Nadi jothisyam centres. R refuses to come with me, will have to caox one of my friends. It would be even cooler to hear the predictions from his own beak :). This is a winning post Madhu :)…left us all with big smiles. That is something I have never heard of. I’m so pleased to have been introduced to such a “colourful” tradition–who’da thunk?! Great pics too! Then I shall have to look out for more of the “Who’da thunk” traditions. India is a veritable treasure chest of such things 🙂 Living in the big city makes it a bit more difficult though.